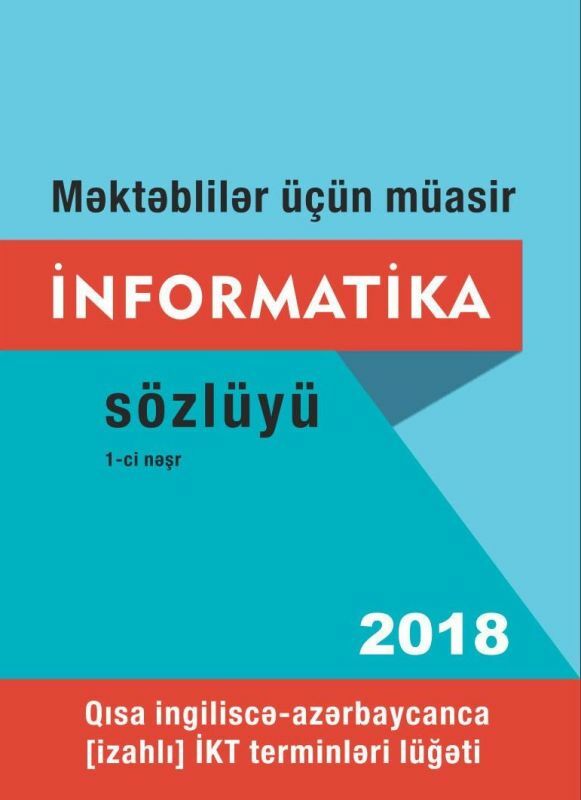 Baku, publisher: mammadli.az – 2018, 162 pp. The about 3,000 words presented here were selected from among 60,000 words and expressions most used by leaders and professionals in the fields of computer and information technology. The dictionary is explanatory and educational, and intended for secondary school students, teachers and users of computer technology. It is also very useful for people who participate in social networks, as it presents terms commonly used on Facebook, Twitter and in chat programs. The free online version http://enaz.online of the dictionary is available on Android systems. I express my gratitude to Emin Huseynov, Phd student and Research Analyst at the University of Geneva, who voluntarily developed the electronic version of the dictionary. Bakı, mammadli.az – 2018, 162 səh. Sahəyə aid 60 minə yaxın termindən seçilən 3 minədək ən çox rastgəlinən, gündəlik istifadə olunan, kompüterdə çalışanların bilməsi vacib olan terminlərdən ibarət bu sözlük izahlıdır və öyrətmə funksiyası daşıyır. 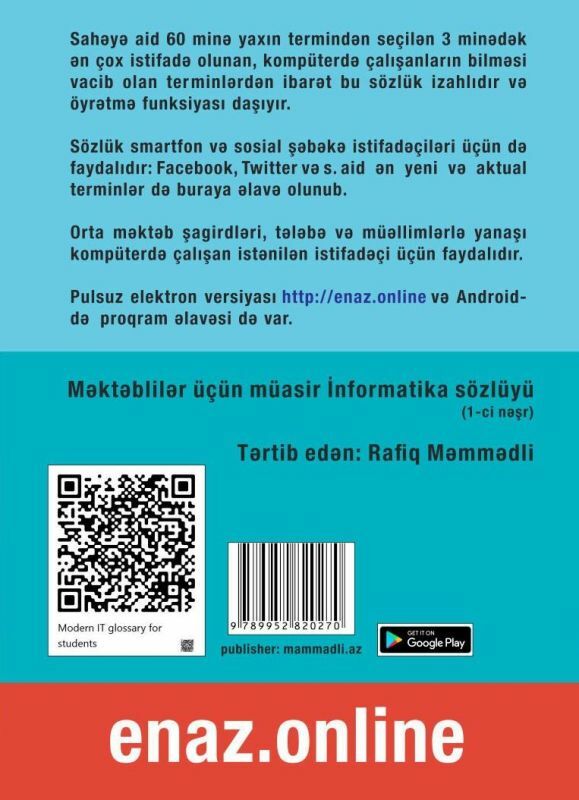 Lüğət smartfon və sosial şəbəkə istifadəçiləri üçün də faydalıdır: Facebook, Twitter, messencer və çət proqramlarına aid ən yeni və aktual terminlər də buraya əlavə olunub. Optimallıq üçün sözlüyə mənası aşkar duyulan, məsələn Archive (arxivləşdirmə). Active (aktiv, cari) və ya Internal Modem (daxili [qurulu] modem) tipli terminlər bilərəkdən daxil edilməyib. Lüğətin sonunda coğrafi terminlər və ən çox işlənən smileylrin açması da verilib. Sözlüyün http://enaz.online elektron versiyası da mövcuddur.